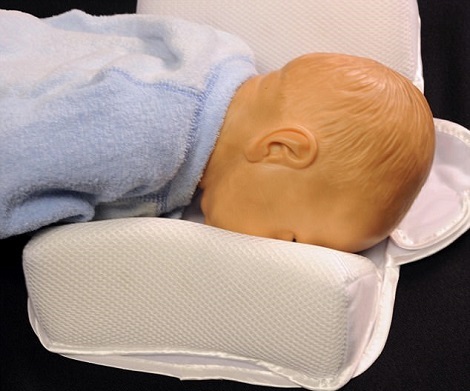 A health watchdog has warned parents that baby sleep positioners can cause their newborns to suffocate following reports of 12 deaths in the US. The Food and Drug Administration (FDA) in the US has issued a statement explaining the pillows – often called 'nests' or 'anti-roll' products – can cause babies to sleep in a position that could cut off their oxygen. The products are supposed to help infants to snooze safely, however, at least 12 infant deaths have been linked to the items. All the cases reported in the US involved babies rolling from their sides on to their fronts and they subsequently stopped breathing. Despite the body issuing the same safety warning seven years ago, sleep positioners are still being sold in stores and online in the US and UK. They are currently available from John Lewis and Amazon. 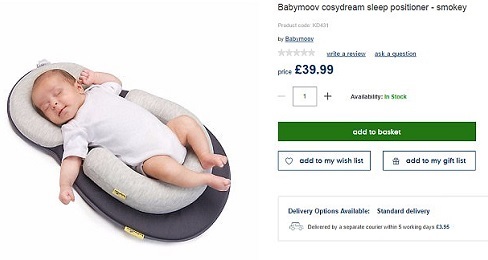 After being contacted by MailOnline, eBay, Tesco and Mothercare announced they are banning the controversial items. A spokesperson for eBay said: 'Following recent recommendations by US authorities, items of this nature will now be prohibited from being sold on our platform. Tesco then followed suit, a spokesperson for the company said: 'We have removed these products from our website as a precautionary measure. These products were available online only, not in-store. 'These products were sold by a third party on the Tesco website, not sold by Tesco itself.' Just sad!